Location: Donaldson Farms, 358 Allen Road, Hackettstown, NJ 07840. 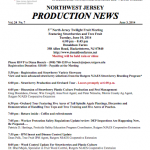 Third Annual North Jersey Twilight Fruit Meeting Featuring Strawberries and Tree Fruit. Meeting will be held rain or shine. Please RSVP to Diana Boesch at (908) 788-1339. Registration Donation: $10.00 – Payable at the Meeting.